Swansea City have confirmed they are in talks with American businessmen Jason Levien and Steve Kaplan about taking a "controlling interest" in the club. The Swans hope an agreement, reported to be worth up to £100m, will be reached in a matter of weeks. "We believe we have a proposal which helps Swansea progress both on and off the field," said chairman Huw Jenkins. Jenkins and vice-chairman Leigh Dineen will stay and the Supporters Trust will retain its 21% stake and board seat. Swansea, promoted to the Premier League in 2011, moved up to 12th in the division and secured their Premier League status with a 1-0 win over reigning champions Chelsea on Saturday before the takeover news broke. The 2013 League Cup winners are largely run by local businessmen and have previously been the target of foreign investors hoping to benefit from the fortunes of the Premier League. Finance in the Premier League increases from next season as Sky and BT Sport paid a record £5.136bn for live TV rights for three seasons from 2016-17 - with each game costing broadcasters, on average, £10.2 million. The current board and shareholders have been in charge of Swansea for 14 years, guiding the club from financial ruin and the brink of non-league football to the Premier League. It appears the board now feels it needs the support of additional investment to help the club grow on and off the field, with the expansion of the Liberty Stadium among the Swans' priorities. Who are Kaplan and Levien? Kaplan is a Los Angeles-based investor who was reportedly interested in buying NBA basketball side Minnesota Timberwolves after founding a capital management company, and is now vice-chairman of NBA side Memphis Grizzlies. Levien, a former chief executive of the Grizzlies, is managing general partner of American Major League Soccer club DC United as well as an advisor to Inter Milan's majority owner and president, Erick Thohir. "Swansea City Football Club can confirm that it is working to finalise an agreement to bring in a new major shareholder. "Board members have discussed an agreement which would see Steve Kaplan, Jason Levien and their investment group acquiring a controlling interest in the club. 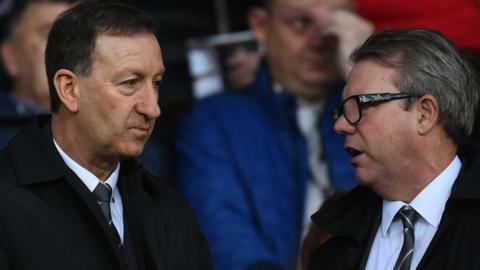 "Chairman Huw Jenkins and vice-chairman Leigh Dineen would remain in their management leadership roles within the club. "Talks will continue with the aim of an agreement being ratified by the end of the season." If Kaplan and Levien's deal with Swansea is completed, the Swans would become the third Premier League team to share common ownership with an MLS franchise, following Arsenal and Manchester City, whose owners also own the Colorado Rapids and New York City FC respectively. Swansea held talks about a potential sale with another pair of American businessmen, John Jay Moores and Charles Noell, in 2014. The club's supporters trust voiced its concern about the prospect of that particular takeover, and negotiations eventually broke down the following year. The Trust previously outlined its conditions for any additional investment and has reacted with "disappointment" that "it was not provided with more time to consider the merits" of the deal with Kaplan and Levien "prior to it being made public". The Trust confirmed it met with Levien on Saturday and a statement read: "We received assurances from Mr Levien that the consortium was keen to engage and work collaboratively with the Trust and supporters to progress the football club, but at this stage we have not had the opportunity to review in detail the terms of the proposed transaction. "The Supporters Trust also met with a number of the other club shareholders this morning. Following that meeting, we understand that this transaction is far from concluded and that we are not the only shareholder who has been kept at arms' length from negotiations to date. "The Supporters Trust can confirm that it is not in receipt of any offer from the consortium for the purchase of any of the Trust's shares in the football club and at this stage is not anticipating any such offer to be made. "It is common knowledge that some shareholders in the club have been actively working to identify potential purchasers for their shares in the football club. As an organisation, we are aware of the need for investment in the club."